Diamond set wedding rings have never been more popular. The combination of precious metals and and diamonds are irresistible to many. We use the finest diamonds and precious stones and the same dedication to innovative design and and exceptional quality in our engagement rings as we do in our wedding rings. For your piece of mind, all our diamonds are ethically sourced and conflict free. You don’t have to be an expert to know what you like, but it might help to know a little of the technical “lingo” before you start looking at the real thing. Invented by the GIA (Gemmological Institute of America) in the 1940’s, the standards largely adopted by the diamond industry are known as the 4c’s :- cut, colour, clarity and carat. The 'cut' refers to a diamond’s proportions, symmetry and polish. 'cut' shouldn't be confused with 'shape'. 'Shape' refers to the general outward appearance of a diamond (such as round, emerald or pear), the “cut”, or 'make', refers to the facets, their shape, size, proportions and relative alignment on the surface of a diamond. It is the 'cut' that determines a diamond's fire, sparkle and brilliance. Though extremely difficult to analyse or quantify, the cut of any diamond has three attributes :- brilliance (the total light reflected from a diamond), fire (the dispersion of light into the colours of the spectrum) and scintillation (the flashes of light, or sparkle, when a diamond is moved). A diamond's cut grade is an objective measure of a diamond’s light performance. When a diamond is cut to good proportions, light is reflected from one facet to another and then dispersed through the crown or top of the stone. If the cut of the diamond is too deep, or too shallow, light will escape through the pavilion before it can be reflected. The illustration below illustrates the cross-section of three brilliant cut diamonds, of the same carat weight, with differing proportions. cut No.1 reflects light correctly, cut Nos.2 and 3 are both compromised and allow light to escape through their pavilion facets. In 2005, the gIA launched a diamond cut grading System for standard round brilliants in the d – Z colour range. This system, the product of more than 15 years of intensive research and testing, assigns a 'cut' grade to all certificated diamonds ranging from 'excellent' – 'Poor'. 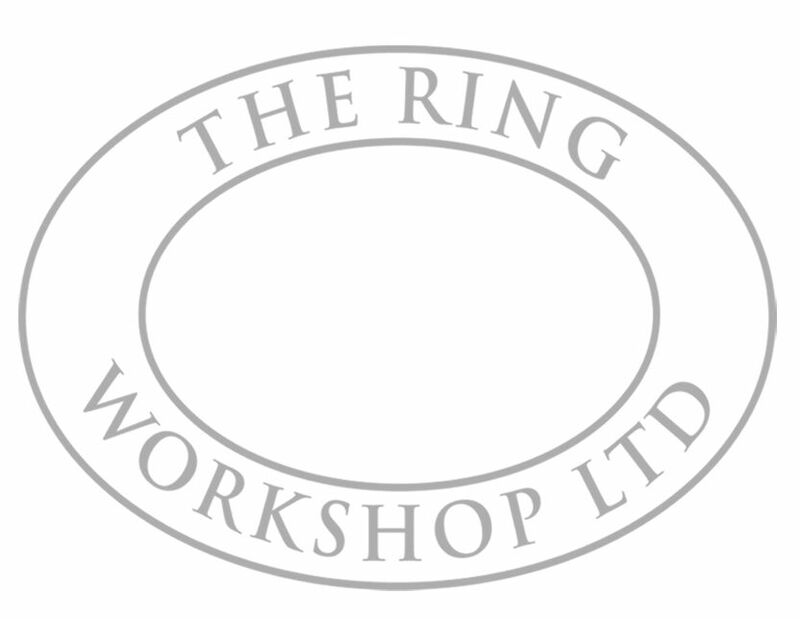 The Ring Workshop only recommends and stocks diamonds with either 'excellent' or 'Very good' cut grades – all inferior and compromised cuts are rejected. In nature the absence of any colour is very rare and diamonds are no exception. The colour of a 'white' diamond is determined by the presence of nitrogen. As most diamonds contain tiny amounts of nitrogen they will display minute variations of colour. The untrained eye may not be able to detect these variations but these distinctions affect the rarity and ultimately value of every diamond. Consequently diamond colour refers to a diamond's lack of colour, grading the whiteness of a diamond. colour is rated according to a precise scale, running from 'd' (colourless) to 'Z' (saturated). Past 'Z' a diamond’s colour is considered 'fancy'. Natural 'fancy' coloured diamonds are very valuable and, correspondingly, are graded by very different parameters. In 1940 the gIA developed the standardized diamond colour grading Scale. The scale begins with the letter 'd', representing colourless, and continues, with increasing presence of colour, to the letter 'Z'. Each letter grade has a clearly defined range of colour appearance. diamonds are colour graded by comparing them to carefully calibrated stones of known colour under controlled lighting and precise viewing conditions. Many of these colour distinctions are so subtle as to be invisible to the untrained eye, but these slight differences have a significant influence on a diamond’s quality and price. The Ring Workshop only stocks and recommends diamonds of 'd' – 'g' colour grades – all inferior and compromised colours are rejected. Why does the GIA Colour Grading Scale start at the letter 'D'? Before the gIA developed the d – Z colour grading Scale, a variety of other systems were loosely applied. These included letters of the alphabet (A, B and c, with multiple A’s for the best stones), Arabic (0, 1, 2 and 3) and Roman (I, II and III) numerals, and descriptions such as “gem blue” or “blue white”. The result of all these grading systems was inconsistency and inaccuracy. Because the creators of the gIA colour Scale wanted to start afresh, without any association with earlier systems, they chose to start with the letter “d” – a letter grade normally not associated with top quality! Much is made of a diamond's clarity but, of the four c's, it is the easiest to understand and, according to many experts, generally has the least impact on a diamond's appearance. clarity is a measure of the number and size of the tiny, natural imperfections that exist in all but the finest diamonds. gemmologists refer to these imperfections with a variety of technical terms including inclusions and blemishes. clarity, therefore, is the term that is used to indicate the extent to which a diamond is free of these natural imperfections. diamonds with the least and smallest imperfections receive the highest clarity grades. using the GIA International diamond grading System, diamonds are assigned a clarity grade that ranges from FLAWLESS (FL) to diamonds with obvious INCLUSIONS(I3). The GIA clarity Scale contains 11 grades. In determining a clarity grade, the gIA assessment considers the size, nature, position, colour and quantity of clarity characteristics visible under 10x magnification. A stone is said to be flawless if, under magnification, no inclusions ('clouds', 'pinpoints', or 'crystals'), no internal flaws ('feathers') and no external imperfections ('scratches', 'burns' or 'abrasions') are visible. Diamonds and other gemstones are weighed in metric carats – one carat is equal to 0.2 grams, about the same as a paperclip. Just as a pound is divided into 100 pence, a carat is divided into 100 points. for example, a 50-point diamond is described as 0.50 carats and weighs 0.1g gram. It is, however, important to remember that carat is specifically a measure of a diamond’s weight and by itself may not accurately reflect a diamond’s size. We tend to evaluate a diamond’s size by viewing it from the top because this is how diamonds are presented when set into jewellery. To understand a diamond’s size, its carat weight should be considered in conjunction with its cut. As previously discussed, no two diamonds are the same and two 0.50–point diamonds can have very different proportions determined by the quality of cut. A heavy diamond, of a deeper cut with its weight 'hidden' in the base of the stone, may well look smaller than a lighter diamond with a shallow cut. The graphic below illustrates the diameters of perfectly proportioned diamonds, with either an 'excellent' or "Very good" cut grade in 0.25ct, 0.50ct, 0.75ct, 1.00ct, 2.00ct and 3.00ct increments. The carat takes its name from the carob seed. These small seed had a fairly uniform weight and early gem traders used them as counterweights in their balancing scales. The modern metric carat was adopted by the united States in 1913 and other countries soon followed. Today, a carat weighs exactly the same in every corner of the world. Flourescence is the visible light some diamonds emit when they are exposed to invisible ultraviloet (UV) rays. On a GIA diamond grading report, fluorescence refers to the strength, or intensity, of the diamond's reaction to long-wave UV. The light emitted lasts as long as the diamond is exposed to the ultraviolet source. Yes. Of the diamonds submitted to GIA over the past decade, approximately 25 - 35% exhibit some degree of fluorescence. However, only 10% of those show strengths of fluorescence that may impact appearance (i.e. strengths noted on laboratory reports as medium, strong or very strong). In more than 95% of the diamonds that exhibit fluorescence, the colour is seen as blue. In rare instances, the reaction is yellow, white or another colour. GIA studies show that, for the overwhelming majority of diamonds, the strength of fluorescence has no significant impact on appearance. Indeed, in many instances, observers prefer the appearance of diamonds that have medium to strong fluorescence.